The brethren of City Lodge No 2514 held their annual installation at Woolton Golf Club with Andrew Prowse being installed into the chair of City Lodge for the second time. Pictured from left to right, are: Kevin Poynton and Andrew Prowse. 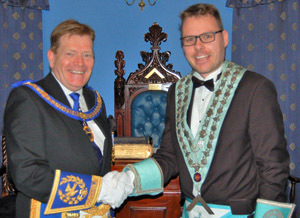 WM Ian Barton opened the lodge in due form and after transacting the regular administrative business, the lodge was raised to the third degree, whereupon the lodge DC Stephen Riley announced that Assistant Provincial Grand Master Kevin Poynton stood without and demanded admission. Ian replied that the lodge would be delighted to receive him. Kevin Poynton entered the lodge accompanied by the Woolton Group Chairman Andrew Whittle, grand officer David Withey and acting Provincial grand officer Robert Williams. After warmly welcoming Kevin, Ian offered him the gavel. In reply, Kevin said that he was delighted to be present at the installation and only too pleased to accept the gavel, but on reflection returned it so that he could enjoy the evening. Kevin was then saluted in due form, followed by salutations to the other grand and Provincial grand officers. The lodge was adjourned to the second degree and Ian requested that the following past masters assist him with the installation; Eric Shepherd installing senior warden, Stephen Riley Jnr to remain in his position and act as installing junior warden and Tom Arnold to also remain in his position and act as installing inner guard. Master elect Andrew Prowse, was presented by his proposer into Freemasonry Stephen Riley Jnr, before being asked to reaffirm his obligation. Having resumed labour in the third degree, Andrew was then installed as WM by Ian. The third degree working tools were presented by Arthur White and the second and first degree working tools were delivered in fine style by Eric Shepherd. The WM then invested his officers for the ensuing year. The address to the newly installed master was by Stephen Riley Jnr, the addresses to the wardens and deacons by Andrew Whittle and Peter Johnson respectively, whilst the address to the brethren of the lodge was given by Kevin Poynton. Pictured from left to right, are: Mike Cunliffe, Andrew Whittle, Kevin Poynton, Andrew Prowse, Ian Barton, David Withey and Robert Williams. The ceremony of installation being concluded, Kevin rose to convey the congratulations of the Provincial Grand Master Tony Harrison and said that Tony hoped Andrew would have a happy, but most of all, a healthy year. Kevin continued by saying that had Tony ben present he would undoubtedly have congratulated the installing master on a very fine ceremony. Andrew then had the pleasure of presenting a £250 cheque to Kevin for the MCF 2021 Festival. The lodge was then closed and the brethren retired to the dining room to enjoy the festive board. Responding to the toast to his health, Kevin added his personal congratulations to Andrew and wished him well for his year in office. Kevin also congratulated the brethren who took part in the ceremony and had a special mention for Arthur White and Eric Shepherd for their excellent presentation of the working tools. Kevin went on to say that the lodge had a number of light blues and asked them to consider making the next step in Freemasonry by becoming Royal Arch Masons. In conclusion, Kevin mentioned the hard work that the Woolton Group executive put in on behalf of its members and that the letters for first appointments and promotions had been delivered. One of the brethren present at the festive board was Tom Lunt, who having given many years service to Freemasonry and the Woolton Group has been promoted to PPrSGW. This was received with rapturous applause and brought the evening to a close. Kevin Poynton and Andrew Prowse (centre), together with light blues and grand and acting Provincial grand officers.